When a stock you think is value takes a plunge, what should your thought process be when evaluating your entry point. Everyone wants to own that stock with that great business model when its beaten down. But how low is low? We talk about having a game plan when waiting for a correction recently. When it comes to an individual stock or a specific market segment, the game plan is a bit different. Your previous model will have evaluate the returns per unit risk. But what if this issue here is an unknown unknown? The concept of margin of safety Benjamin Graham talks about involves taking care of the known risks, known unknowns, but also leaving enough buffer should there be unknown unknowns. Now that the unknown unknowns have become known, can you see how this affects the underlying cash flow forecast? Is this business permanently impaired? My view is no matter how impaired it is, there is always a liquidation value to it. The difficulty of not catching a falling knife, or a lost cause and getting the attractive once in a lifetime bargain hinges on your skill in valuation. The difficulty for most people is that they have not done enough deep research and do not have adequate information to estimate a close enough fair valuation. That fair valuation, would let you know if the stock have fallen low enough. In the case of a macroeconomic situation like Europe, valuation is hard to know whether all the known risks have been priced in. In individual stock, that might be the case as well. Hypothetically, lets say Starhub has an event that caused the stock price to plunge. Starhub, is the blue chip with that recurring income that is thought to be as very defensive, paying out 20 cents of dividend yearly. Say for example, over the top TV have become so prevalent that people don’t watch pay TV anymore. Here is a 3 year chart of Starhub. Click to see a larger view. Lets say the stock price falls from the current high of $4.44 to $3.2 (1). A drawdown of 27% would have been a good price to buy. But what if its still not fair value. Without the over the top TV encroaching of their pay TV business, the fair value would have been at (3). 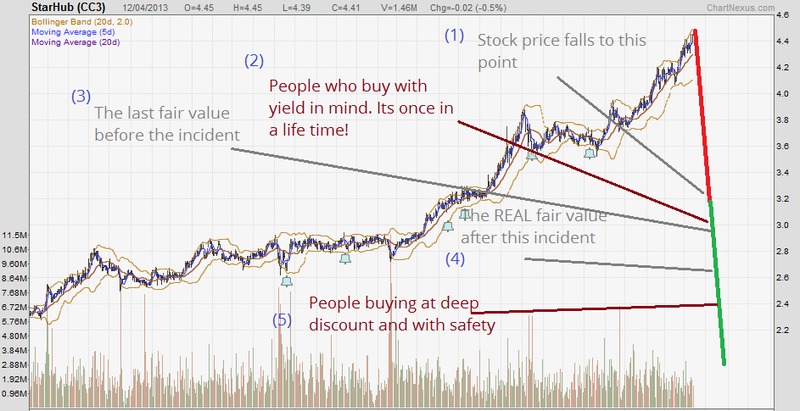 The yield investors will be pilling in at ( 2). They would be thinking getting 20/300 = 6.66% yield is a sweet deal. If you have evaluate what a permanent or a partial impairment of the pay tv business to Starhub, you would have arrive a value close to (4). But no one knows (4). You can only estimate to the best of your ability. This is why I say this can be a rather challenging game. But knowing (4), gives you that yardstick to know what kind of risks you are taking. Whether it is BP, Apple or Starhub taking a plunge in a normal market condition (read not a bear market), you can either punt or you can speculate rationally. It’s a challenging task, but if you are willing to work for it, you may own that dividend stock with that great yield. If you like this article do share it with your friends. unless one is speculating then there is no point of timing an entry. Fundamental analysis is only for explain later whatever happening, and for fun only. I did hear: “this security is good in basic, the company is very good in investment other field.” but stock price still go down until 3 years later. Why ? The stock trend and market trend is just going down. Don’t believe any Fundamentalist say, unless your have a lot of money to burn. Hi, market pricing and realization of value may not happen together and that is when there is an opportunity. i just wanna highlight the second level thinking mentioned by howard marks in his book as well as in this intw. the approach of second level thinking makes absolute sense and logic, but for non-prof investors (like myself), sometimes it’s just hard to dedicate the amount of time and resources needed to sieve through tons of info (relevant and irrelevant ones) to develop a confident call on a stock (using second level thinking). Hi kai xiang I think you are right to a certain extent. Er….sorry, might be a vey newbie question….why do we use 20/300 to calculate the yield and not 20/3000? I thought we can only buy in lots of 1000 shares? Then 0.20 per year dividend yields only 20/3000 = 0.66%? Ah My mistake. Should be 200/3000. Thanks. Hi, May I know which article explain how we value a stock?